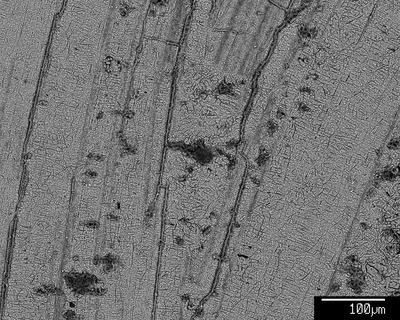 "Laminae pinching out hidden by recrystallization patch. Note darker la" by M. Spilde, L. Melim et al. Image Type: SEM Image, Scale Bar: 100um, Magnification: 190, Etch: No etching, Coating: Au/Pd, Instrument Location: UNM, kV: 15.